This is who we are. It’s also what we do. 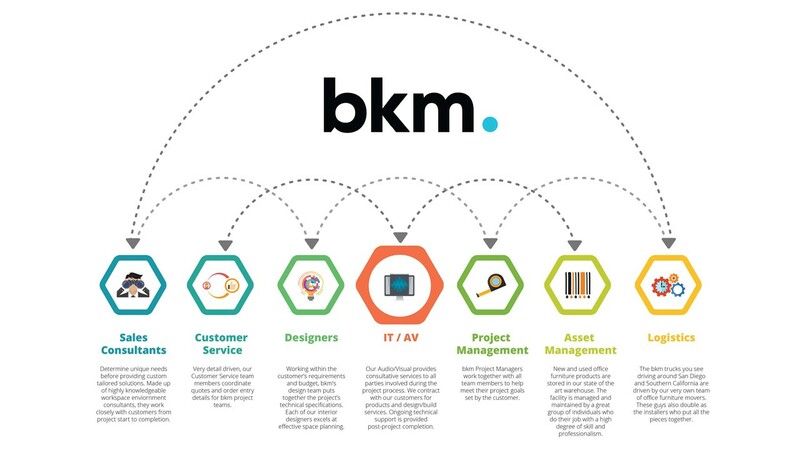 bkm OfficeWorks sells architecture, furniture and technology products to create dynamic work environments. We represent over 300 manufacturers including Steelcase, the leading provider of office furniture worldwide. We serve a diverse market including healthcare, biotech, education, government, high tech and finance. bkm is led by CEO Bill Kuhnert, who works closely with COO Jim Skidmore and the bkm Leadership Team to oversee bkm’s daily operations. Our in-house staff is comprised of professionally trained and experienced consultants, project managers, planners, designers, movers and installers. Each member of our team is committed to providing premium services with the highest level of integrity.